Two new cards have been revealed: a Rare Priest spell and an Epic Hunter spell. Mass Hysteria was revealed in the fourth episode of the "Ticket to Greatness" series by Wronchi Animations. 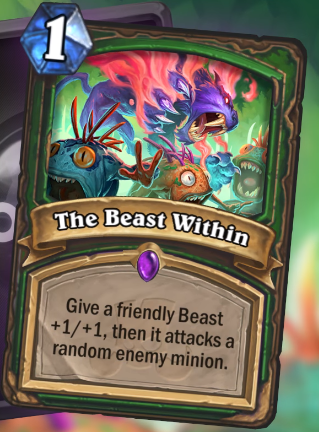 The Beast Within was unveiled by Omnislash. Visit our Rastakhan's Rumble expansion guide for everything you need to know about Hearthstone's upcoming expansion, releasing next week! both are good, but i'm not sure about their rng. 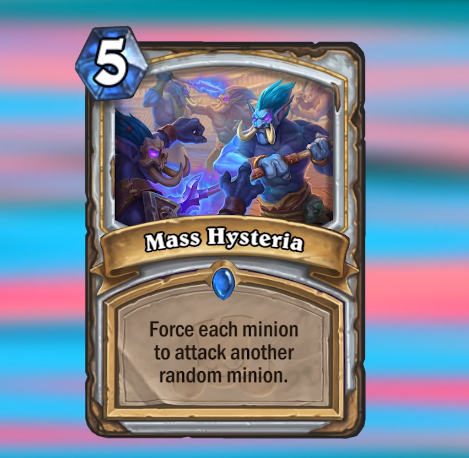 mass hysteria is a nice board control but there is more rng to it than brawl. The priest card is good against some boards, not so good against others. Not sure you’d want to rely on it, but maybe a one off in some decks. Hunters have enough good stuff revealed already. This one seems pretty rubbish to me. 1mana +1/+1 isn’t worth using up a card slot for, even with the pseudo 1 turn windfury if you attack with it first. It could be interesting with a (cheap) "venom" minion, IMO. I would argue the exact opposite. Brawl potentially leaves the most powerful enemy minion on the board. But with Mass Hysteria you can predict the exact outcome. For example: after an Emerald Spellstone you definitly clear the whole board. Or a board full of 1/1 or two Mountain Giant etc. It has to compete with Psychic Scream, though. One of the best Boardclears ever printed. I guess. Needs to survive the first attack though. I guess one additional option is to give the minion random rush the turn you play it. Some boards it is good, some it is bad. For instance, for a board full of even shaman totem and small junk after they’ve just dumped down two sea giants the most-likely scenario is worse with this than brawl, as is the worst-case scenario. Trump makes the valid point in his review vid that it can be used to kill stealthed minions (like all the new spirits) if you can clear the rest of the board first.